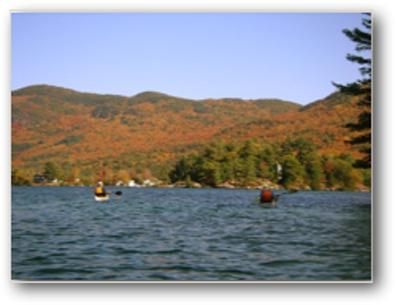 Saturday, October 20: Six of us in three cars converged on Huletts Landing on the East side of Lake George, just north of the group of islands known as the Mother Bunch. Two cars were coming from the east in Vermont, while Bruce and I would travel north from Albany to join them. Arriving at Washington County Park in Huletts Landing at about 10:45 am, ours was the second car to arrive. Sam and Frank were already there with their boats unloaded. Bruce and I began to do the same as the third car carrying Rob and Karl arrived. Sam and Frank were only paddling for the day, while the rest of us would find an accommodating island and spend the night. The day paddlers, eager to get started, set off as the rest of us packed our boats for the trip. We agreed to cross to the western shore and join them there. As it turned out, this was not a good decision. Everyone had had a one-and-a-half to two hour drive to the launch point. That and the weather pattern, which was rainy and cool but predicted to break by noon, accounted for our late start. The weather was still very cloudy and threatened rain, but the temperature was warm for October in the mountains. Southwest winds of 12 to 15 miles per hour, gusting to 30 were predicted, but from where we were situated on shore, neither the winds nor the wave conditions looked too bad. And, as Lake George has a more or less north-south orientation, we expected to have some shelter along the western shore. We launched at 11:35 and headed on a diagonal for the western shore of the lake. As soon as we rounded the point that shelters Huletts Landing we began to experience the wind. The further we paddled, the stronger it got. We paddled mightily into the head wind and waves, yet it felt like we were barely making progress. My GPS unit showed that we were working hard to just make three miles per hour. After we reached the western shore, we discovered that this section of the lake bends so that it aligned exactly with the Southwest wind blowing that day. There was little or no shelter to be had. A decision was made to hug the western shore to gain what little relief we could find, rather than re-crossing the lake to hide behind the islands to the east. As the waves rose, my boat, loaded with gear, began to throw water over the deck and onto my spray skirt. An occasional light shower rained down. I wished I had put on my splash jacket. Here and there we could duck in behind some small point of land and paddle along the shore out of the wind. Out of the wind, we easily made four miles per hour with less effort. I never saw the Mother Bunch Islands to the east as we passed by. At a distance they blended into the far shore perfectly. 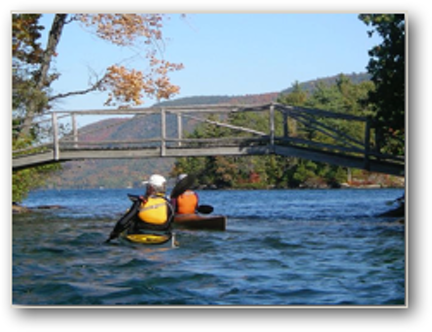 Soon we were the Narrows, that part of Lake George where the lake pinches in like the tiny waist of a voluptuous woman. This part of the lake is dense with islands, almost making a labyrinth to find your way through. Frank knew this part of the lake pretty well and recommended several campsites. Eventually we found a site on Big Burnt Island with a fairly flat place to pull our boats ashore. The site faced northeast, with plenty of protection from the day’s strong wind. 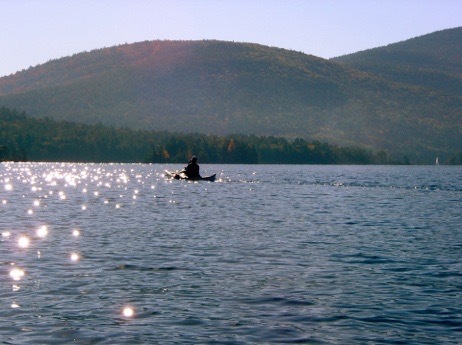 It had taken almost three hours of hard paddling to cover less than nine miles to the campsite. We quickly set up our tents. The site was large with plenty of space for everyone. It should be noted that all of the sites in the Lake George Islands State Park must be reserved ahead of time until after Columbus Day. By planning this trip late in October, we did not need a reservation. We had our choice of sites and could pick and choose as conditions dictated. As Big Burnt Island is indeed big, we decided to explore. There were probably a dozen or so campsites on the island. Many were within eyesight of each other and most were within hearing distance. Every site had a dock for the use of power boats, which thankfully had been pulled out of the water for the winter. During the season, the place must be jumping. But today, we were the only occupants, save for a pair of pesky red squirrels that kept getting into Rob’s food. After our walk, Bruce and Karl decided to go for a paddle. Rob and I stayed in camp, completing our setup and gathering firewood for an evening campfire. I set the kindling and broke up the gathered wood so we’d be ready once the sun went down. 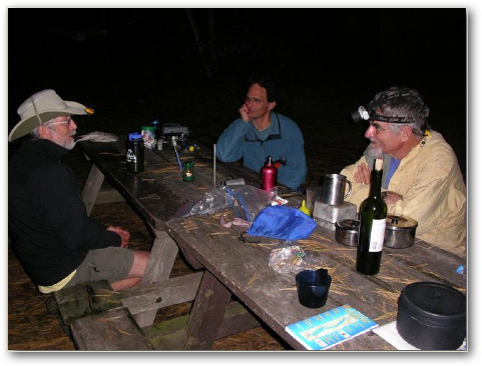 Around sundown, the kayakers returned and we began to make dinner. A bottle of wine was uncorked and snacks produced while we each prepared our dinner. Bruce and I had garlic and olive oil couscous, barbecued chicken and carrots. We skipped the desert of baked bananas because we were quite full. We took our time eating and cleaning up, as the weather was unusually warm and the night very pleasant. It was overcast, with the moon slipping in and out of view over the eastern shore. The wind had moderated some and we were protected on the lea of the island. The fire was lit. We fed it and told stories as guys do until about 9:30 pm, when everyone turned in. Sometime later, the wind swung around and we went to sleep to the sound of wind in the trees and waves lapping on the shore in front of our tents. Sunday, October 21st: It was a warm night for October, with temperatures in the high forties. The wind dropped to nothing. A shower moved in about 2:00 am but passed quickly. My new sleeping bag was very comfortable and I slept well till Bruce arose at 6:30 am. I followed at 6:45 am, limping to the picnic table to make coffee while I worked out a sciatic nerve problem. Dawn on any lake is always beautiful, and this morning was no exception. I watched the sun rise on a beautiful day, sipping my coffee while warming my hands on its container. Bruce headed off on a hike. After a while, Rob arose, and we were joined by Karl, who was just back from a swim. Breakfast was oatmeal with almonds, raisins and brown sugar, warm and hearty on a cool morning. We discussed our paddling options for the day. The wind was to be slightly less intense, but out of the same Northeastern direction. 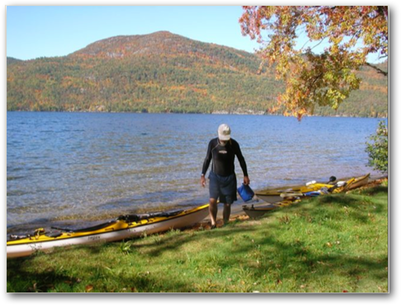 We decided we would paddle south through the Narrows along the western shore until we reached Montcalm Point. Montcalm Point is the southern tip of a peninsula that separates the Narrows of Lake George from Northwest Bay. This peninsula contains the impressive (by Eastern standards) Tongue Mountains, and is home to some rare New York Timber Rattlers. At Montcalm Point, we would cross to the eastern side and wander north through the islands in the Narrows and Mother Bunch until we reached Huletts Landing, our take-out point. It was less than two miles to Montcalm Point. Everyone was feeling energized by a good night’s sleep, breakfast and the beautiful late October morning. We covered the distance quickly, and crossed to the eastern shore. As we crossed, we could clearly see Dome Island. Dome Island dominates the lake, as it sits directly in the center of the lower lake and is the highest point on the water. Dome Island was fortified and used to control lake traffic during the Revolutionary War. It is off-limits without special permission to land there. We picked our way through the islands of the Narrows, passing between many of them. As we passed we explored the many empty campsites from the water, always looking for the “perfect” spot for future trips. Soon we paddled past Big Burnt Island and last night’s campsite. We paddled to the eastern shore for a quick break to stretch and relieve ourselves of our morning coffee, where we found three large powerboats moored to three of the few remaining docks in the park. They were tucked back behind a small point of land, completely out of sight. Conversation indicated that they had been there since the preceding Wednesday. Continuing north, we exploring Commission Island from the water. We went ashore at Commission Point, a designated picnic area and the trailhead for Black Mountain. It has one of the few sand beaches we had seen in this area, which made for an easy and safe landing. Here we had lunch and explored the area on foot. After lunch, our northern route kept the eastern shore on our right and, eventually, the Mother Bunch islands on out left. As I paddled through this area along a stretch of ancient lichen and tree encrusted sheer walls, I was stopped by what sounded like rain. The whole area was in deep shadow. After some time I could see that water was dripping down the whole face of the rock. Soon I heard a stronger sound like running water. Looking more closely, I could see a small stream coming down the rock near the water’s edge. I visually followed this stream upward to where it ended in a gush of water emerging from the rock face about forty feet up the sixty foot wall – a natural spring! It was a wonderful and unexpected surprise. In no hurry to be off the water, we meandered northward, poking into bays and inlets, circumnavigating islands and generally exploring to our hearts content. All to soon we arrived at the entrance to Huletts Landing and went ashore. Rob, Karl , Bruce and I unloaded our boats, packing gear back into bags and then into our cars in a much less organized fashion than when we arrived yesterday morning. We were nearly finished when one of the Vermonters said, “We have about an hour before we need to be on the road. 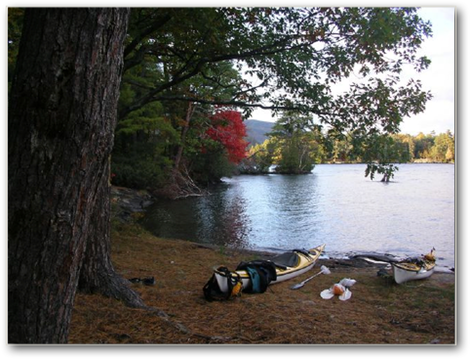 Why don’t we paddle further north for a half hour and return before we leave.” There was no problem selling that idea. We paddled north as far as Agnes Island, returned and took our leave, the end of a great trip.